Every word and every action begins with a thought. Negative thoughts based in jealousy, greed, or hatred may seem harmless on the surface. After all, they're only thoughts, right? But while thoughts are only in our head, they often betray our intentions, and can directly shape our actions. So, how can you overcome internal negativity and live more consciously? 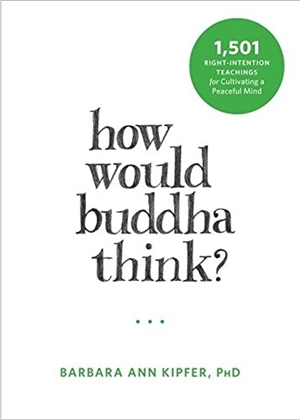 In How Would Buddha Think?, best-selling author of 14,000 Things to Be Happy About, Barbara Ann Kipfer offers an insightful, modern take on the ancient teaching of Right Intention - an important tenet of the Buddhist Eightfold Path focused on the belief that our intentions drive our actions. With this book as your guide, you'll learn how to move past negative thoughts or ill will toward others and instead focus on altruism, purpose, and self-actualization - qualities needed to help you live a truly happy life. Dr. Barbara Ann Kipfer is the author of 14,000 Things to be Happy About with more than 1.25 million copies in print. Among her 70+ publications are list books of creativity and wisdom like 1,001 Ways to Live Wild (National Geographic), as well as thesauri and dictionaries, archaeology reference books, and happiness and spiritually themed books. Look for 1,001 Ways to Slow Down in early 2017. Barbara holds a PhD and MPhil in Linguistics (University of Exeter), a PhD in Archaeology (Greenwich University), an MA (Greenwich University) and PhD in Buddhist Studies (Akamai University), and a BS in physical education (Valparaiso University). Dr. Kipfer is Chief Lexicographer of Temnos. She has worked for Answers.com, Ask Jeeves and Ask.com, Bellcore (now Telcordia), Dictionary.com and Thesaurus.com, General Electric Research, Google, IBM Research, Idealab and Knowledge Adventure, The Chicago Tribune, and WolframAlpha. By: Barbara Ann Kipfer PhD What Would Buddha Say?